Make sure you know what to do in an emergency and avoid property damage. A crack or opening in your home’s foundation, basement walls, windows or doors. Failure of your foundation’s drains or weeping tile system. Overflowing eavestroughs or plugged downspouts. Overgrown tree roots that block, shift or collapse pipes. Flooding can also occur due to a main drain or sewer line backup or when wastewater backs up into your home through a drain, toilet, sink or washing machine in your basement. Seal all cracks or openings in and around your basement walls, floors and window wells. Clear leaves, nests and muck from blocking eavestroughs and downspouts so rain water can properly drain. Get a dehumidifier for the basement – especially for humid summer months – this won’t prevent flooding but it will keep your basement drier. Find out if the grading around your home slopes properly away from the foundation so that water drains away from it. Avoid clogging toilets, sinks or bathtubs with items that don’t belong down the drain, including: cooking grease, coffee grounds, bones, egg shells, food, gum, paper towels, baby wipes, feminine products, cotton swabs, cat litter, cosmetics, paint, car fluids or bleach. Make sure your plumbing and drainage throughout your property and in your home are in good working order – this may involve contacting a qualified plumber to help you understand how your plumbing and drainage systems work and offer solutions to make flooding less likely. Install a backwater valve – this is a device that prevents sewage in an overloaded main sewer line from backing up into your basement. Check if your municipality offers rebates for this precautionary measure as part of their flood protection programs. If you have a backwater valve, have it inspected regularly to make sure it’s still working. Inspect laundry hose bibs – if you have old rubber hoses that connect the water to your washing machine, there’s a chance they could burst. Check for bulges. It’s best to upgrade to more durable braided water supply lines. Even without a catastrophic flood in your basement, water and moisture may still be slowly seeping in from outside, particularly if you’re in an area with a lot of snow or rain. Besides the obvious damage and inconvenience water can cause to your investment, continual moisture in your basement can result in mold and, with it, potential health problems for you and your family. 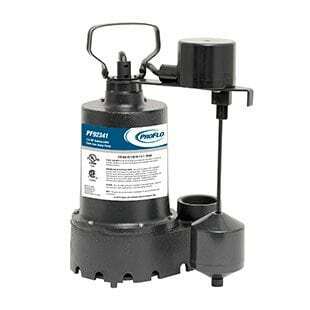 An electricity-powered sump pump, housed below the floor of your basement, can automatically pump rising water and drain it away from the foundation to help keep your basement dry. If you have a sump pump, it’s a good idea to check it periodically to make sure it’s in good working order – monthly if it disposes of water from a washing machine, and once a season otherwise. In both cases, the pump screen or inlet opening should be cleaned. Alarm: If your pump has one, it should be tested. Check valve: This can help prevent water from flowing back after it’s pumped out. Pit: The hole the pump sits in needs to be deep and wide enough for the machinery to work properly. Discharge location: It’s recommended that the location where pumped water is discharged is at least 6 meters (20 feet) from other homes so water doesn’t drain into neighbouring properties. If you think you may need a replacement sump pump, or you want to learn more about a back-up sump pump, a Reliance Home Comfort™ plumber can provide expert advice and installation. Call 311 or your city’s water services department right away – they’ll try to determine the cause of the flooding and provide suggestions. Keep your family and pets away from the flooded area. Avoid using water in your home until you understand what’s causing the flooding – water from your sinks, toilets, bathtub or dishwasher and other appliances could exacerbate the problem. Consider shutting off the electrical power if it’s safe to do so and, if you use gas and smell it, leave right away and contact your gas company. Call your home insurance company to report possible property damage and follow their instructions, including taking photos, and holding onto receipts for any emergency repairs or clean-up you may have to pay for. 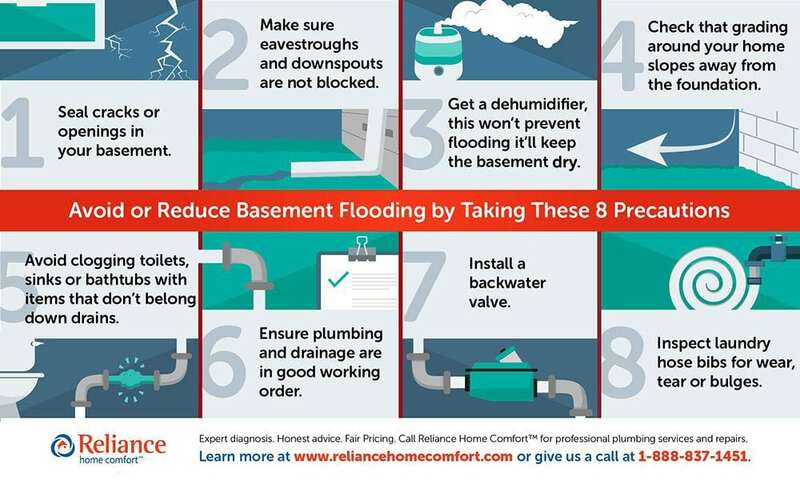 A licensed Reliance Home Comfort plumbing expert can offer helpful advice on how to avoid or address basement flooding. Plus, consider a convenient Reliance Plumbing Protection Plan. It can save you plumbing service costs over time and lessen the risks associated with basement flooding. Flip through our library of helpful plumbing information. Here, we debunk some of the most common plumbing myths to save you money and avoid plumbing issues. Here are 5 of the most common water leaks and some helpful suggestions. Call us today to fix your clog or for any plumbing products and services you need. **Plus Applicable Taxes. Subject to terms and conditions. Subject to excluded components as set out in Terms & Conditions.